I’m up to my elbows in butter, sugar, flour, and chocolate. Yes, it’s that time of year again – the cookie frenzy. 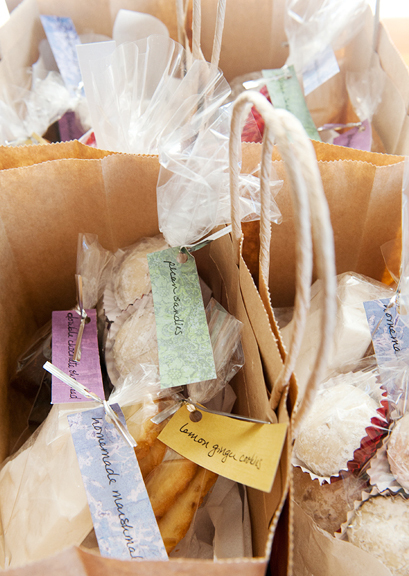 Thanks to a back muscle spasm over the weekend that kept me from standing or walking, I had to rush getting all of the baked goods and confections out the door in one very long and exhausting day. But they’re done and you can stick a fork in me! In addition to the cookies, marshmallows, and homemade hot cocoa mix, I included a jar of homemade vanilla sugar. It’s such an easy do-it-yourself project and it makes a great gift with a personal touch. 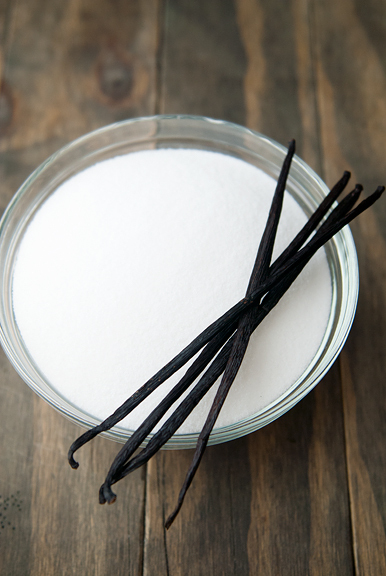 Use vanilla sugar in place of regular sugar for that extra vanilla oomph. Even if you can’t think of a use for it, just open the jar and get a whiff of that floral, sweet, and heady perfume. Vanilla beans can be a spendy baking item, but because I go through a lot of them, I buy organic vanilla beans in bulk from saffron.com for a great price. Once you scrape the seeds out of the pods (don’t get rid of the pods! 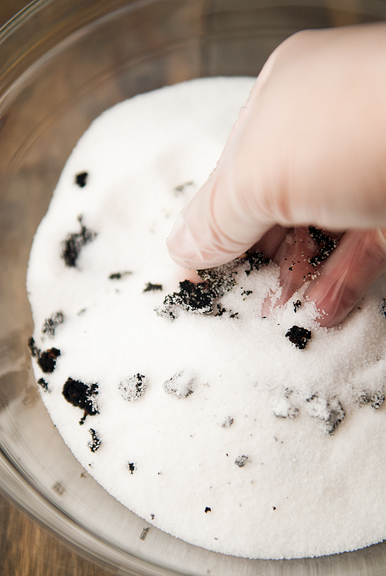 ), place the seeds in the sugar and rub the seeds into the sugar until all of the clumps have been broken up. It helps to wear a disposable glove unless you like having your hand smell like vanilla forever. You can leave the pods whole or slice them in half if they’ll fit into your vanilla sugar containers better that way. Place the vanilla pods in your intended vanilla sugar container – either a big one for yourself or smaller containers for gifts – the pods will also help infuse the sugar with vanilla goodness. 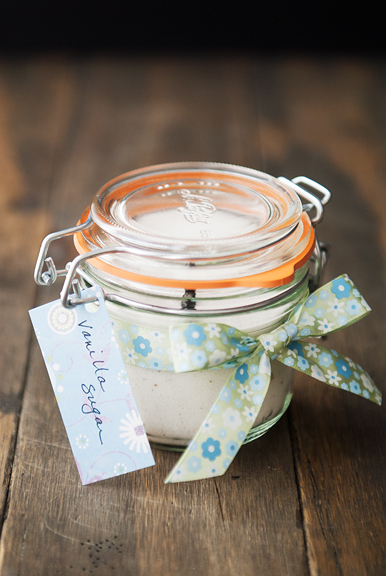 Fill the jars with the vanilla sugar. The sugar is ready to use as soon as you have mixed it, but if you let it sit in a sealed container for a week or longer, the infusion will become more intense. Need a quick last-minute homemade gift? 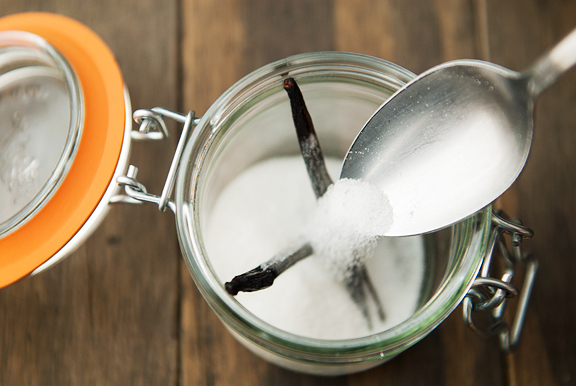 This vanilla sugar is a snap to make and perfectly suited for this festive time of year. Maybe make some extra to keep for yourself? Place the sugar in a large bowl. 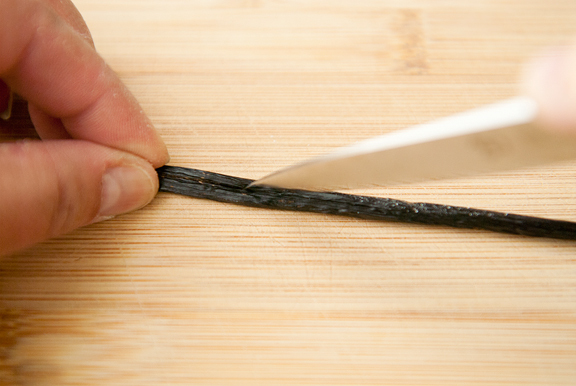 Split open each vanilla bean lengthwise with the tip of a sharp knife. Scrape the seeds out from the pods and place the the seeds in the granulated sugar. 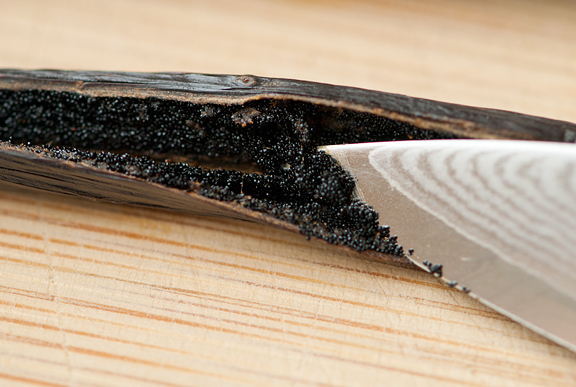 Rub the vanilla seeds into the sugar with disposable-gloved hands. 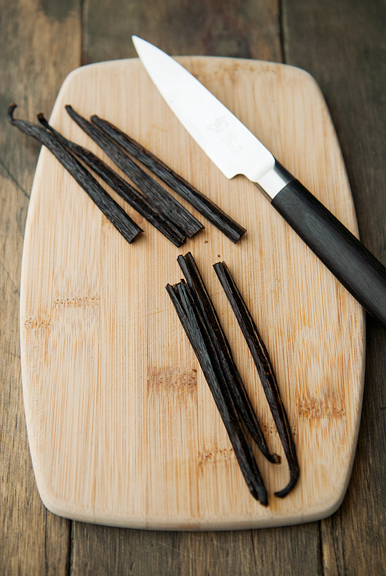 Cut the vanilla pods in half. Distribute the pods among your vessels (I used 8-ounce canning jars). Fill each vessel with vanilla sugar. Seal and store in a cool dark place. The flavor should intensify with time. Makes 4 8-ounce jars. HOW DID YOU KNOW this was on my homemade-gift-making agenda for TODAY! I looked all over for a recipe and had decided to just wing it and hope I got the amounts right. Sending you holiday love and thanks for all the inspiration! We must all be on the same page! I totally made some this weekend to give away as my wedding favor! :) Happy holidays and thanks for all of your great photos and recipes! Lovely idea! Hope you are feeling better. gentle hugs…….. Thanks for that! I wanted to send vanilla to family, but was unsure about leaking containers considering elevation changes. The vanilla sugar was just the thing. Also, it’s a great way to have vanilla right away while we’re waiting for the extract to extract. Amanda – yay! Great minds think alike! And happy holidays! Barb – I didn’t even think about shipping. Nice! I hope they loved it.